viniciuskps sent this in the other day. 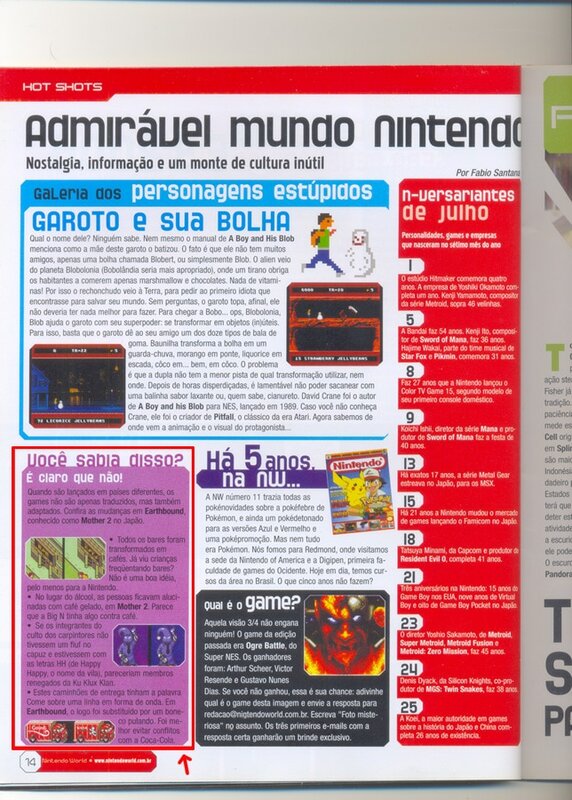 It’s a scan from Nintendo World Brazil #71, from July 2004. In it, it shows some of the differences between EarthBound and MOTHER 2. 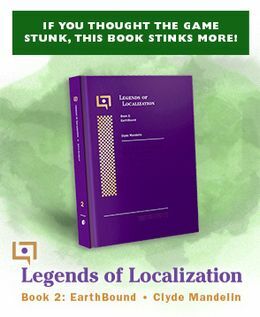 When released in different countries, the games are not just translated, but also adapted. Check out the changes made in Earthbound, known as Mother 2 in Japan. All the bars were transformed into cafes. Have you ever seen kids going to bars? Doesn’t seem like a good idea at all, at least not for Nintendo. In place of alcohol, people would get alucinated with cold coffee in Mother 2. It seems like the Big N had something against coffee. If the members of the carpainters cult didn’t have a fluf on their hats and were kept with the letters HH (which stands for Happy Happy, the name of the village), they would look like members from Ku Klux Klan. These delivery trucks had the word Come above a wave-shaped line. In Earthbound, the logo was changed to a jumping man figure. It was better not to mess with Coca-Cola. Not surprisingly, the pics used in this article were taken straight from my old site that compared the two games. The new version of said site is here, but you can see the old pics used here, here, and here. i don’t really think they went too deep in the “protect the children” stuff. they just took out the more obvious images. Nintendo was just like that back then. As Screwattack.com described it in their Wolfenstein review, they “pussified” it. Now the possible product references are another thing. I remember they had to fix things like that in Mario Kart 64 when it was being localized. Something like the signs on the side of the track had product references. Some of the were kind of funny, like Marioro made to look like the Marlboro logo. That’s kinda weird how a magazine would take pics from your site and publish them. I remember to read it on the magazine. “Alucinado” was used instead of drunken, or stoned.